When a translation is certified, both the translated document and the original must be accompanied by a signed statement from the translator certifying the accuracy of the translation and his/her translation competence. 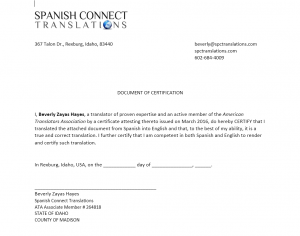 This documentation is a requirement if you see that a document needs a “Certified Translation” or a “Certificate of Accuracy.” This statement can also be notarized by a notary public if needed. If you’re on a tight deadline, please contact me at [email protected] to make sure I’m available. E-mail me a clear, scanned copy of your documents. In the body of your e-mail, please include your name, phone number, the address to which you would like the translations mailed if you need hard copies and any special instructions. I’ll respond to you with an exact quote and a turnaround time. For three or fewer pages, turnaround time is normally three (3) business days. For formatted documents such as birth, marriage and death certificates I charge a flat rate of $75.00 per page. This rate includes document translation, formatting, and my certificate of accuracy. For documents needing notarization (translator’s identity confirmation), there will be an additional fee of $20.00. Payment is in advance via credit card (online payment fee of 2.9% + 0.30 applied to total). Instructions provided via email. My fee includes returning your translations and certification by regular postal mail. If you need your translations faster, I can send them by FedEx, Express Mail, etc. and bill you for the cost. For same day certified translations, there’s an additional rush fee of $25.00. If necessary, I can also send your translations to a third party, such as an international credentials evaluation service, college or university admissions office, etc. Please note: I cannot give U.S. equivalents of the grades, degrees or credentials on your Spanish documents. For this, you need to contact a credentials evaluation service. Remember to always research the certification requirements to ensure you’re complying with what the institution or government agency needs from you. Some entities require a notary’s stamp on the certificate. Others require their own flavor of “certification”: a fellow translator recently did a translation that required her to sign on top of the envelope flap after sealing it. The point is, it’s hard to know what every government entity, university, or professional certification body requires. Make sure you are well informed with the details of what you need and together we can make this happen without setbacks. Do you still have questions? Contact me here.